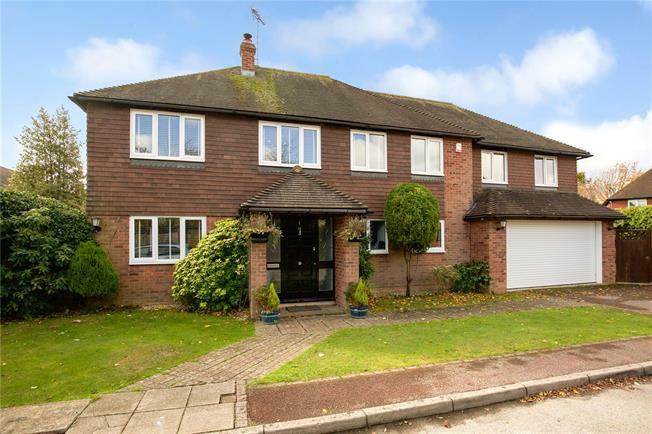 5 Bedroom Detached House For Sale in Horsham for Offers in excess of £800,000. This spacious house has been thoughtfully extended to provide superb accommodation over two floors, producing an ideal family house. As shown on the attached floor plan this accommodation includes a study at the front of the house, an open plan modern kitchen breakfast & dining/family room (with bi-folds entering into the garden) a spacious utility room, dual aspect sitting room and two further generous reception rooms. The first floor provides a master bedroom with dressing area and ensuite, four further bedrooms and a spacious refitted bathroom. St Georges Gardens is situated within one mile of Horsham town centre, in a small close just off the Kings Road. The town centre itself offers an excellent range of shops, entertainment and sporting amenities together with excellent schooling. Horsham mainline station which is 0.6 of a mile distant provides regular services to London Victoria (55 minute approximately) and Thameslink services via Three Bridges. The gardens are enclosed, predominantly to the south west of the house with beautifully stocked borders and a lovely patio, to the east of the house there is also a lovely enclosed courtyard. To the front of the house is a driveway and a store (previously part of the garage) with a large up-and-over door.